This is the fifth among multiple posts concerning the Atlantic Yards/Pacific Park Quality of Life meeting Tuesday 10/9/18, held at 55 Hanson Place and sponsored by Empire State Development (ESD). 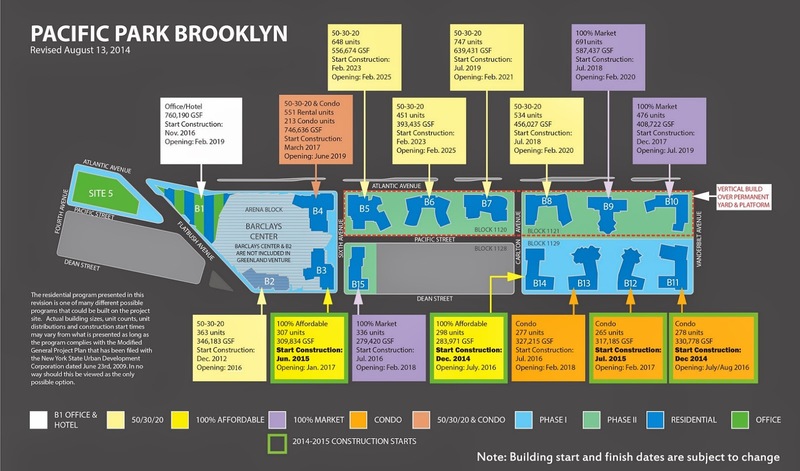 The first post concerned the Atlantic Yards Community Development Corporation; the second post was about work in the Vanderbilt Yard; the third post concerned contracts for future project monitors; the fourth post concerned plans for the B4 tower at the northeast corner of the arena block. I wasn't able to attend but am relying on an audiotape of the meeting. Greenland USA project manager Scott Solish said his firm was were "proud to be be partnering" with developers TF Cornerstone and The Brodsky Organization, which were "ideal partners" with "deep roots in New York City." Unmentioned were the terms of the deals that Greenland Forest City Partners--controlled since June 95% going forward by Greenland USA--struck with the two family-owned firms. The sale was portrayed by the Wall Street Journal as a sign of Greenland's weakness, but that's not clear: Greenland might have gotten such a good deal in assuming all but 5% of Forest City Realty Trust's/Forest City New York's share of the project--after a previous 70/30 split--that it could offer the other developers reasonable terms. Brodsky will be working on B15, aka 664 Pacific Street, the tower just east of the arena block, between Dean and Pacific Streets. The building will rely on the design by Marvel Architects that was revealed in December 2015, which was devised with input from the School Construction Authority, since a middle school will be at the base. "Construction at B15 will likely begin in early 2019," Solish said. That should leave time for the school to be finished for the 2021-22 school year, since the buildout is supposed to take two years. Coupled with construction up the block at 18 Sixth, that portends significant traffic congestion on Sixth Avenue east of the arena. 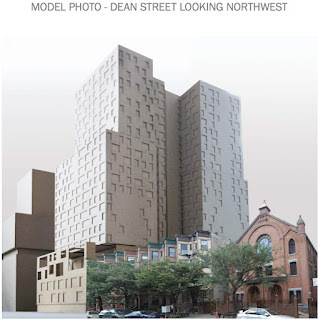 However, given the loss of a project-wide 421-a tax abatement that previously allowed for 100% market-rate buildings, this rental tower will contain at least 25% affordable units, as the 421-a law now requires. B15 will contain about 320 apartments, Solish said. That's a little less than the 336 units once forecast. TF Cornerstone, said Solish, would work on B12 and B13 likely in late 2019 or early 2020. "They are taking a fresh look at designs." The building sites are between Dean and Pacific streets, and Carlton and Vanderbilt avenues, sandwiched by the already constructed 535 Carlton (B14) at the western end of the block and 550 Vanderbilt (B11) at the eastern end. Greenland Forest City had in September 2015 revealed plans for B12, then scheduled to be a condo building, as was B13. The B12 design was prepared by the architecture firm KPF, but presumably TF Cornerstone is re-evaluating the design, given that the building will instead include rentals. These two buildings will both contain rentals, with a total of about 800 units. Averaging 400 apartments each, the units would presumably be smaller than the previously planned rental buildings (see below) with 277 and 265 units. Who's in charge? Who's coordinating? Resident Gib Veconi, who helped get the 2025 affordable housing deadline as part of advocacy via the BrooklynSpeaks coalition, asked if Greenland was transferring the development obligations associated with the project. Greenland remains responsible for delivering the total 2,250 units of affordable housing, and the percentage in these three buildings, likely 25%, will be counted toward those obligations, said Tobi Jaiyesimi, ESD's Atlantic Yards project manager. She said ESD made sure the new companies are vetted and can provide completion guarantees for those sites. "Is that arrangement scalable?" asked Veconi, positing a scenario in which development rights to other lots are transferred. "You can end up with a situation where Greenland is building nothing." When does the state receive a completion bond? Veconi asked. Does the state have the capacity? Veconi suggested that the ESD's "relatively small staff" might be taxed coordinating with three developers. "We already have a precedent for three or four buildings," she said, citing a previous wave of construction. "We’re going to make sure that communication is open." Veconi recalled a past presentation from Greenland Forest City Partners regarding standardization of things from truck protocols to badges identifying construction workers. "Is Greenland still going to play that role?" Yes, he was told. Solish noted that four different construction teams worked on previous sites, and were able to coordinate with two developers, the joint venture and also Forest City New York (which was building 461 Dean itself). "It's just a little more layered than that," suggested Veconi. "The two people… who are sitting here," said Solish, referring to reps from Brodsky and TF Cornerstone, "understand... the expectations." Does the state, Veconi asked, have any other projects run like this? "Atlantic Yards is very unique," Jaiyesimi allowed. "The state does not have a project identical to this," said Phillips, but it does have equally large projects like the Javits Center and Moynihan Station, and "Moynihan is very, very complicated," involving three or four developers. "The question you’re asking us? We can manage this." "I'm not concerned about the state's ability to manage large projects," said Veconi. "I was really just thinking about the structure of this one."